“Remember 1314”? Really? Is legendary Scots king Robert the Bruce, a figure from the Middle Ages, really the face of Scottish independence from Great Britain? Apparently so. One face, at any rate. Mel Gibson — a.k.a. William Wallace, the Bruce’s contemporary and sometime ally — is another. Voters will go to the ballot box this September to decide whether to seek independence from the United Kingdom. If the measure prevails, its backers will have fourteen-century forebears to thank. And indeed, the Financial Times‘s Gideon Rachman reports that “Remember 1314” has become a rallying cry of the independence movement. Why 1314? This year, of course, marks the centennial of the outbreak of World War I. Largely drowned out in the din over Archduke Franz Ferdinand’s assassination was the 700th anniversary of the Battle of Bannockburn. That’s what the slogan urges posterity to commemorate. At Bannockburn a Scottish host commanded by the Bruce defeated an army headed by English king Edward II, the not-so-fearsome son of Edward I, a monarch affectionately known as the Hammer of the Scots. Battlefield triumph kept Scotland more or less independent until 1707, when the Act of Union — the measure unifying England, Scotland, Wales, and Ireland — went into force. That’s a significant feat of arms. And yet the anniversary came and went last month with little fanfare outside Scotland. Only four days separated it from the Franz Ferdinand centennial. It’s tough for the Bruce and Wallace to make headlines under those circumstances. The history wars, it seems, flare up from time to time not just in Northeast Asia but in Old Europe. Just as in China, or Japan, or Korea, seemingly obscure historical figures and events can rouse supposedly atavistic, pre-modern passions in postmodern Western breasts. It’s almost like human nature is a constant or something! If so, the independence referendum slated for September promises to be a rather Thucydidean contest. Thucydides, another dead white European guy, famously catalogued fear, honor, and interest as the prime movers for human actions. Scotland’s referendum on independence will pit patriotic sentiment — the thirst for honor and renown in Thucydidean parlance — against purely rational economic and political interests. The Scottish people have little to gain in material terms from severing ties with London. They’re more likely to lose out. But it appears a sizable segment of the population considers that a price worth paying for Freeeeedommm…!!! to quote the immortal Wallace/Gibson at his most eloquent. And the electorate will render its verdict in an environment artificially free of fear that might dissuade Scots from dissolving the three-century-old union. Independence proponents evidently assume, for instance, that institutions such as the European Union and NATO will grant Scotland easy admission. That would ameliorate any economic dislocations while hoisting a security umbrella over the country. Hence it’s easy for the independence movement to soft-pedal the hazards of its preferred course of action. It remains to be seen, however, whether European institutions really will open the doors to Scotland. Maybe a touch of fear should be in the mix when deciding how to vote. Thucydidean motives, it seems, may align to permit — or indeed impel — Scots to do something against their interests. Interestingly, such a confluence of motives drove Scotland into the United Kingdom in the first place. At the turn of the 17th to 18th centuries, Edinburgh bankrupted the nation trying to colonize Darien, the least hospitable part of the Isthmus of Panama. The Darien expedition was an exercise in honor — a whimsical bid to keep up with the empire-builders down in London. When the colony came to grief, leaving them holding the bill, Scots had little choice other than to acquiesce in English proposals for union. So it appears, to this son of Scots that independence advocates are attempting to overturn the results of a bad decision that turned out well with another bad decision that might not turn out so well. Hmm. I grok the Scottish bid for independence. And yet I don’t get it intellectually. Tell you what, kinfolk. 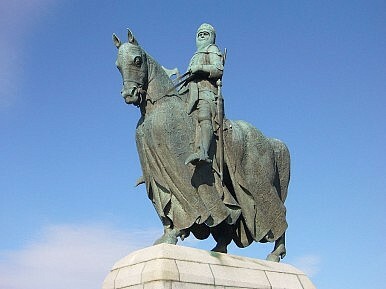 By all means let’s look to Robert the Bruce and William Wallace for inspiration. That’s a legacy worth celebrating. But why don’t we also conjure up some cool-headed logic from Adam Smith, David Hume, and other giants of the 18th-century Scottish Enlightenment? Let’s give Enlightenment rationality — a.k.a. Thucydidean interests — a chance.